I used to love Animazement. Can anyone remember this show that was THE show to see at Disneyland (on the Fantasyland Theatre Stage, too?) I know I am dating myself here, but when I was 17, I use to go to Disneyland just to see Animazement – all show times during one day. I just kept going back. That’s how much I loved that show! It had a huge following, too. And then one summer, I came back, and guess what: No more Animazement. They had discontinued it. One of the saddest Disney days ever. Well – guess what: Mickey’s Magical Map is the modern day Animazement! I was *THRILLED* to say the least when I realized that! Clearly, it is designed for a new audience, a Mickey Mouse Clubhouse- audience, where everything is digital. So instead of a real set, there’s a giant digital map, which creates the backdrop for the entire show. It’s not just a backdrop though. Characters dance on it, come out of it and disappear into it. Yes, Mickey keeps hopping in and out of the map – it really is incredibly well done. At 22 minutes long, the show keeps kids entertained with lots of colors and interactive displays on the magical map and parents in awe of the artistry. It truly is a Disney masterpiece. The performances are flawless, the songs are stunningly coordinated, seamlessly flowing from one title into another. Just like Animazement, Mickey’s Magical Map also features many different Disney stories, most of them the modern princesses, though. As Mickey Mouse leads through the show (as he follows an unpainted spot on the magical map from story to story), he visits King Louie from from Jungle Book first, and then works his way through Pocahontas, Mulan, Tangled, Ariel, Lilo and Stitch and The Princess and The Frog. 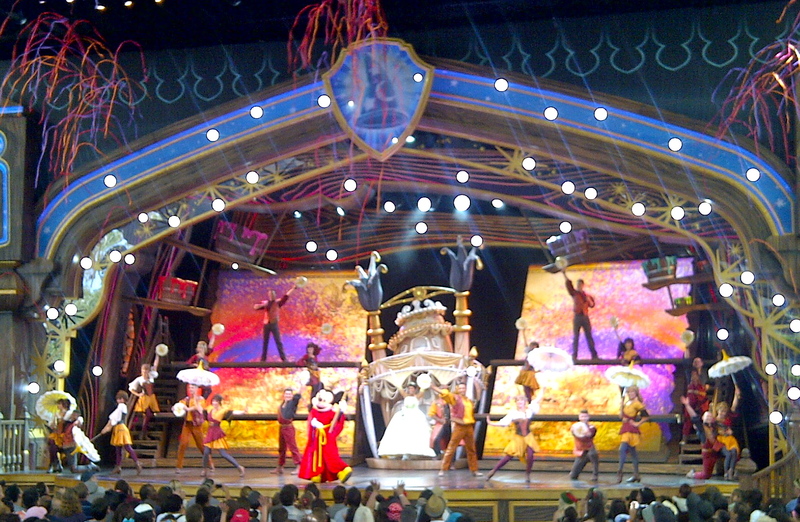 The show also features an original song and an incredible ensemble of dancers performs alongside the Disney characters. I can’t wait to go back and see it again. Who’s with me? ← Sunny Sundays: Happy Memorial Day From Disneyland!